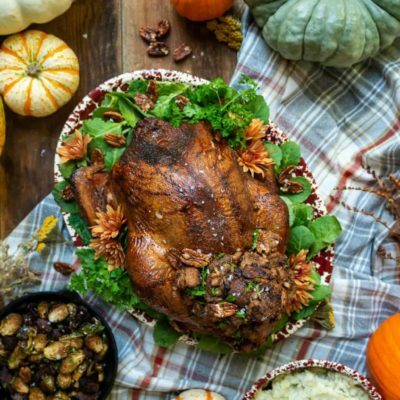 Smoked Turkey with Candied Pecan and Apple Stuffing Recipe may be just the recipe you need to spice things up this holiday season! This post is sponsored by Tony Chachere’s® Famous Creole Cuisine which means it’s spicy and delicious. Words and opinions expressed are my own and I really think you need to taste this recipe yourself. 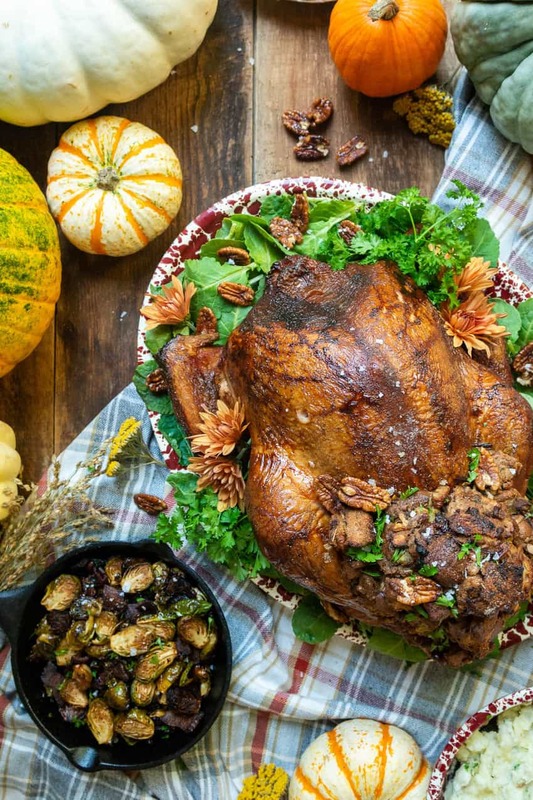 Free up oven space and cut down on prep time with this Smoked Turkey spin! Yep, take the turkey out of the oven and inject it with some flavor. This recipe is going to give you all the bonus space of the oven and doesn’t require a long brine. Break the mold and change the tradition by taking the turkey out of the oven and smoking it outside. But don’t just stop there! Shock everyone with delicious new flavors infused from the inside with fun injectables from Tony Chachere’s®. Are you curious yet? Good. 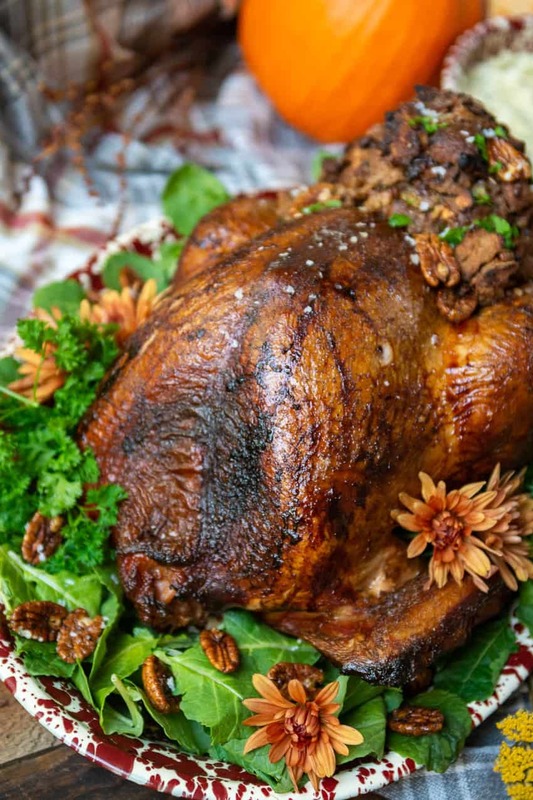 This is smoked turkey with candied pecan and apple stuffing. First, I used Tony Chachere’s® Praline Honey Ham Injectable Marinade. Sure, it said ham on the package, but the moment I had this in the meat lab and had my sights on Thanksgiving, I ran with the idea of pralines. I added some spice to my quick and easy candied pecans with Tony Chachere’s Original Creole Seasoning. Skip the brine time! Turkey loves a good brine. It soaks the meat, infusing flavor from within, but with the quick and easy injection instructions, the brine isn’t needed! A turkey prepped in 15 minutes? 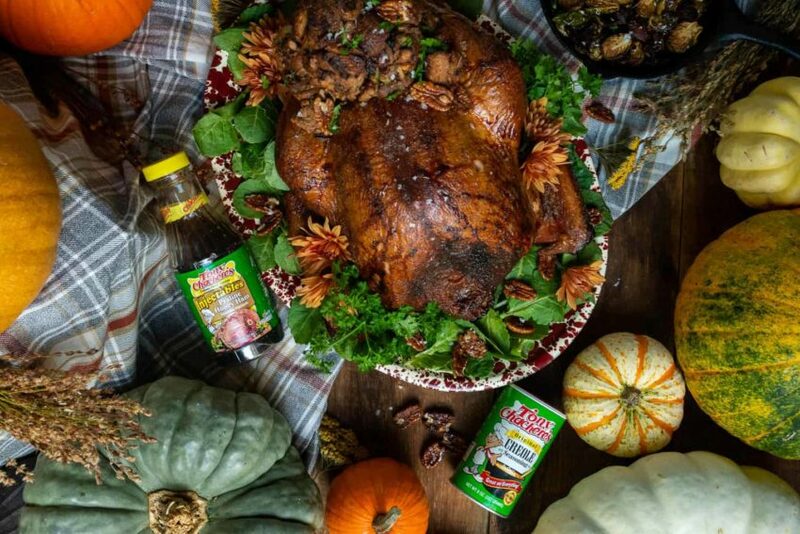 Once you have your stuffing prepped and the turkey injected with the Praline Honey Ham Injectable Marinade, all you need to do is pop it in the smoker and let it go. Smoke until the turkey temp’s at 165-degrees F with an instant-read thermometer. I did brush the turkey a few times with oil and spice blend to keep the skin pretty and add a little extra spice. The smoked turkey had a beautiful smoked hickory skin, the perfect smoked texture and infusion of flavor. Also, smoking cooks the turkey safely while keeping it moist! No dry turkey here! Just after 6 hours of smoking, this 16-pound turkey was ready to carve. The stuffing, added halfway through, had just a hint of smoked flavor and was the perfect sweet and spicy combo to liven things up, but still to tradition. Just follow the easy step-by-step directions below and send me your Thanksgiving Turkey Pics! 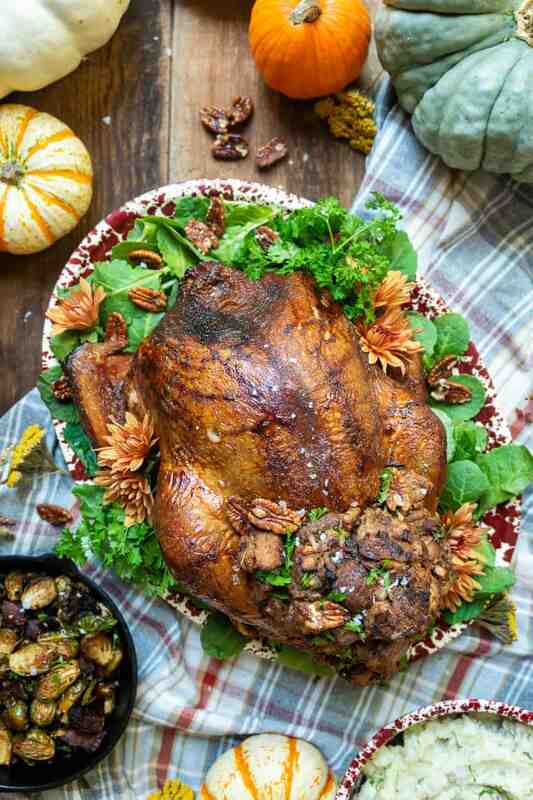 If you’ve tried my Smoked Turkey with Candied Pecan and Apple Stuffing recipe, or any other recipe on GirlCarnivore.com please don’t forget to rate the recipe and let me know where you found it in the comments below. I get inspired by your feedback and comments! You can also FOLLOW ME on Instagram @girlcarnivore as well as on Twitter and Facebook. Toast the pecans until just fragrant, 3 to 5 minutes, stirring as needed. Meanwhile, combine the water, brown sugar andTony’s Original Creole Seasoning in a small bowl. Remove the pecans from heat and quickly pour the brown sugar blend over them. Toss to coat. Pour out onto a wax paper lined baking sheet to cool. The pecans can be prepped 2 days ahead of time and stored in an airtight container until ready to use. Lay the bread out on two baking sheets in a single layer for 4 to 6 hours, allowing the bread to become stale. In the same skillet you used for the pecans, heat the butter for the stuffing over medium heat. Swirl to coat the pan. Sauté the apple, onion and celery until softened, 5 to 7 minutes. Add the garlic, parsley, rosemary and thyme and cook 30 seconds longer. Remove from heat and fold the apple and onion mix into a large bowl with the bread. Add the chopped pecans and toss to make sure everything is thoroughly combined and the bread is all coated in butter. Season with a dash of Tony’s Original Creole Seasoning if necessary. The stuffing can be prepped a day ahead of time and stored in a the refrigerator in an airtight container until ready to use. Prep your electric smoker on the smoke setting. Use apple pellets if possible. See additional directions for traditional smoking. Pat the turkey thoroughly dry. Place into an aluminum pan or other rimmed pan. Tuck the arms back behind the body and tie the legs together, leaving an opening for the cavity for later. Pour the Tony’s Praline Honey Ham Injectable Marinade into a measuring cup and fill the injector. Plunge the injector into the turkey, about 1/2 - 1" apart each time, pressing the injection into the turkey. Place the pan with the turkey in the smoker and smoke for 3 hours. After 3 hours, carefully remove the turkey. Using a baster, remove and reserve any drippings. Stuff the turkey with the prepared Candied Pecan and Apple Stuffing. Mix the vegetable oil and seasoning in a bowl and brush a quarter of it over the turkey. Cook for an additional 3 hours, or until the turkey safely temps at 165 F, basting every 30 minutes with the remaining oil mix and remove the drippings as needed, being sure to reserve them for later. When the turkey has reached an internal temp of 165, carefully remove from the smoker, cover and allow to rest for 25 to 30 minutes before carving. Garnish with additional candied pecans and freshly minced parsley. Meanwhile, make gravy from the reserved drippings and giblets, if desired. What a delicious sounding turkey! I love the addition of the pecans and apple – a good stuffing is so crucial! Mm, I shall look forward to trying this very much! Now I need to make a smoked turkey for Thanksgiving! This looks delish. Hello foodie blooger! This turkey recipe got me like truuu truu truuu screaming like a turkey! It looks so delicious honey! Keep the recipes coming! You could replace the pecans with any nut that your family enjoys / can have. I love walnuts or hazelnuts for things like this as well, but with the pecan injection, the bonus candied pecans do go a long way. Now this sounds like a recipe that I definitely need to try! I’m a big fan of turkey and I love the sound of the apple stuffing. Also intrigued by the candied pecans – sounds so good! Wow! I am blown away by how easy you make all of this seem! And it looks absolutely delicious! 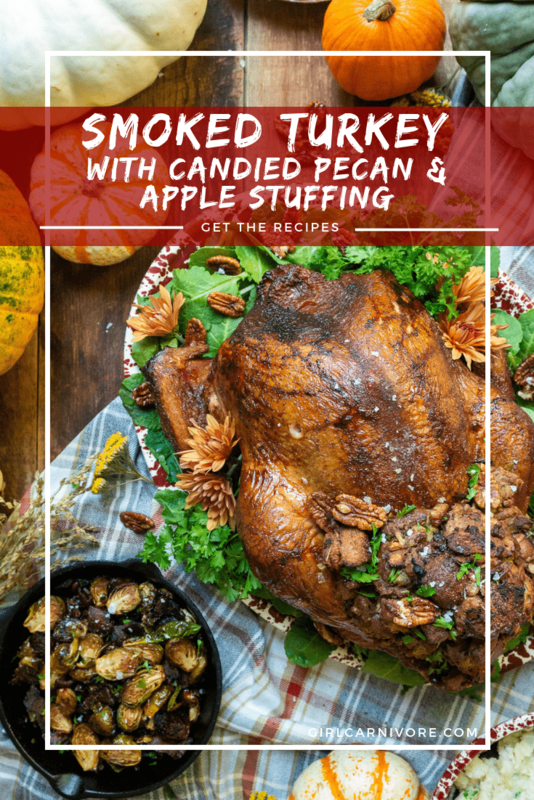 This smoked turkey is perfect for our dinner! It looks so delicious recipe, will add it on my bucketlist. I just love everything about this! This is so good, this will be a huge hit! My husband would absolutely love this. Yum this recipe looks so good. Can’t wait to try to make it ourself. All of this has me ready for Thanksgiving dinner because the pictures look so good. This looks insanely delicious! We eat turkey around Christmastime, so will be bookmarking this for when the time comes around! You have me getting so excited for Thanksgiving!!! Looks delicious!